Modesta Coating is a highly unique clear hard glass layer for automotive paints with a durability of up to 10 years! 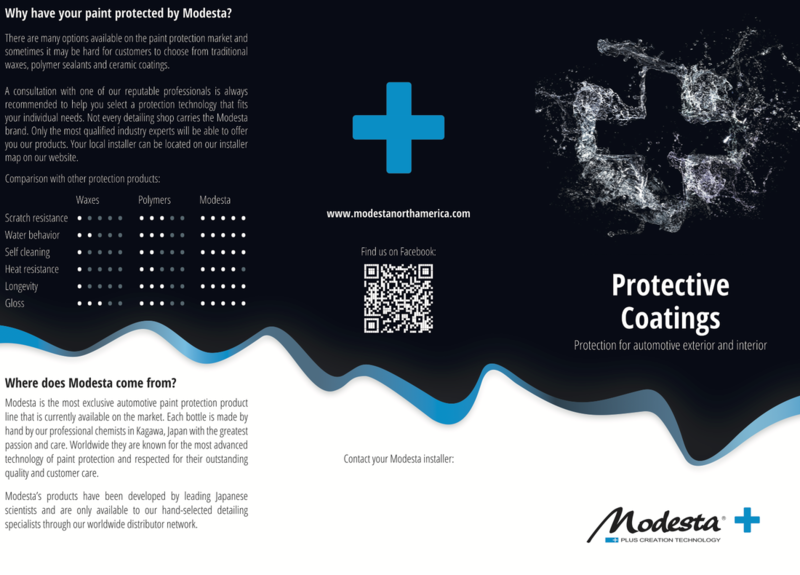 Modesta Coating protects your vehicles paint from all kinds of damage including, oxidation, sap, watermarks, salts, acids and even permanent ink and paints. Its strong water-repellent properties also promote the self-cleaning effects producing longer lasting depth & shine and ease of maintenance. The Advanced Water-repellent Glass Coating can even be applied to the most advanced and sophisticated paint systems, such as Nissan Scratch Shield, Lexus' self-restoring coat and Mercedes Ceramic paint. What are the benefits of Modesta? Products of the Modesta range create a hard, glass-like layer on the clear coat of your vehicle. This thick layer is composed of high grade silicium produced by a special chemical reaction at the time of application. It acts as a impenetrable barrier, protecting the paint from all adverse affects of the environment. No matter how hard the clear coat layer on your vehicle may be – Modesta adds a bit of hardness to it and the layer created will always be harder than the finish of your vehicle itself. Thanks to the thick layer Modesta produces on the paint, it also absorbs damage that would normally be caused directly on the paint. Thus the paint of your vehicle is protected and will retain it’s value longer. A significant part of the protection Modesta Glass Coatings delivers, is the result of outstanding self-cleaning and water behavior properties. With Modesta the vehicle will stay cleaner for longer and will be considerably easier to wash when needed. Consultation with a reputable professional is always recommended to choose a protection product that fits the individual needs of the vehicle owner. Not every detailing shop carries the Modesta Brand. Only the most advanced masters in the industry will be able to offer Modesta Coatings. The Liquid Glass Coating encases your car in a shield of extremely durable and hard glass. The inorganic glass liquid turns to glass on and within the paint surface and becomes part of it. Upon completion of our prep stage, we apply the primer (P01-A) which it will help bond the glass coating to the paint increasing longevity and giving a candy gloss look. The PD Private Label consists of two separate parts - an extremely thick and hard inorganic base coat and a super hydrophobic organic top coat. Both of them combine together during the application to form one durable protective layer, resistant to tar and asphalt from the roads, corrosion, oxidation, chemicals and mechanical damage. Modesta PD is the result of unique development cooperation between Mr. Paul Dalton, the world’s leading detailing expert based in the UK and our chemical engineers in Japan. Modesta PD Private Label requires regular maintenance and yearly renewal. It delivers protection for up to 10 years and is especially suitable for the most exclusive vehicles that can take advantage of professional care. ​Eliminating the risk of scratches should not the only objective in protecting automotive paints. A major cause of paint damages, such as loss of gloss and dullness is paint oxidation. This process can be slowed by isolating the paint surface from the air. Although this can be achieved with conventional coating agents and wax, the oils and fats contained in such materials oxidize easily, and in turn oxidize anything they come into contact with. Once oxidized, these paint protection agents can often accelerate the degradation of paint rather than protect it. The inorganic nature of the BC-03 glass coating makes it fully resistant to oxidation and therefore more suitable for protecting paint. The hard physical barrier it creates also prevents paint from coming into contact with the air and acts as a strong protectant. Modesta BC-03 does not crack, bubble, flake, peel, delaminate, detach or discolor at temperatures up to 700 °C. This new formula combines pure liquid glass and titanium dioxide for extra shine without affecting durability. It contains 0.16μm particles of high grade titanium dioxide that reflect light with specific wavelengths, producing an instant luminous shine and gloss. Titanium dioxide is sensitive to photocatalyzation and produces traces of active oxygen when exposed to UV rays. This effect helps the coating to prevent the attachment of contaminants to the paint. Modesta BC-06 was formulated specifially to withstand higher temperatures, its widely used to prevent brake dust sticking to the wheels and calipers. It can also be applied to exhaust tips makind it easier to clean it. BMW and Porsche owners love Modesta BC-06 as it keeps their wheels cleaner, and when it's time for a wash, it makes that job so much easier.